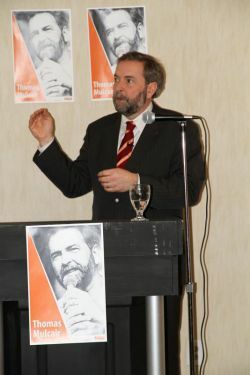 On March 6, 2012, New Democratic Party (NDP) leadership candidate Thomas Mulcair met with UFCW Canada activists and members of the Retail Wholesale and Department Store Union (RWDSU), the Amalgamated Transit Union (ATU), and the Service Employees International Union (SEIU) at the Quality Suites hotel in Toronto, Ontario. 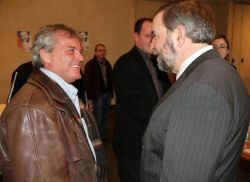 All four unions have formally endorsed Mr. Mulcair's campaign for the NDP leadership. 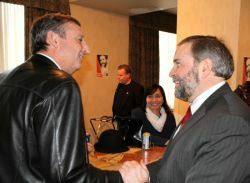 In his opening remarks to the meet and greet attendees, UFCW Canada President Wayne Hanley explained that Thomas Mulcair understands and appreciates labour's role in creating a better society. 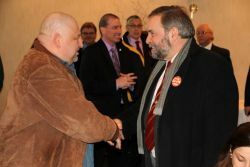 "With Mr. Mulcair as leader, the NDP will have an unprecedented opportunity to progressively shape Canadian politics by forming the next federal government and building a country that benefits all working people," said Brother Hanley. 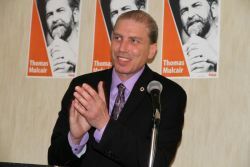 "UFCW Canada looks forward to campaigning with Thomas to elect the country's first labour-friendly federal government." 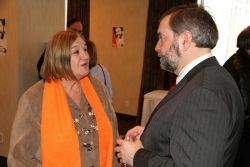 National President Hanley then introduced Mr. Mulcair, who spoke about the dangers that the Harper Conservatives pose to labour unions and working class Canadians. 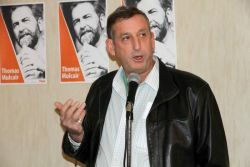 He lambasted the government's assault on unionized workers, as evidenced by its back-to-work legislation for Canada Post employees and its move to prevent Air Canada flight attendants from striking by referring the dispute to the Canada Industrial Relations Board. 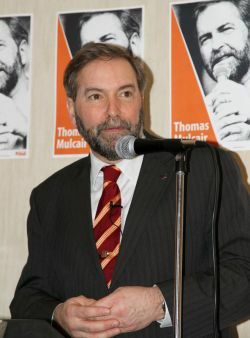 "The Conservatives have sent a signal to the corporate bosses that now is the time to go after past collective agreements and acquired labour rights," Mulcair warned. "It's time for us to step up and say this is not in the cards." 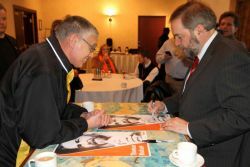 Mr. Mulcair also discussed the challenge that the NDP faces between now and the 2015 Federal Election. "The majority of Canadians share our party's goals and values but sometimes they hesitate when it comes time to vote for us," he said. "Now we have to get them over that hurdle by connecting with people and showing them what we're accomplishing across the country. That way we can produce a Canada that's more prosperous for everyone." 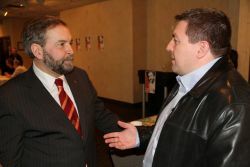 All UFCW Canada members who are eligible to vote for the NDP leadership will receive their ballots by Friday, March 9, 2012. 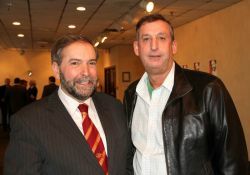 Party members can mail-in their ballots or vote online by visiting www.leadership2012.ndp.ca. 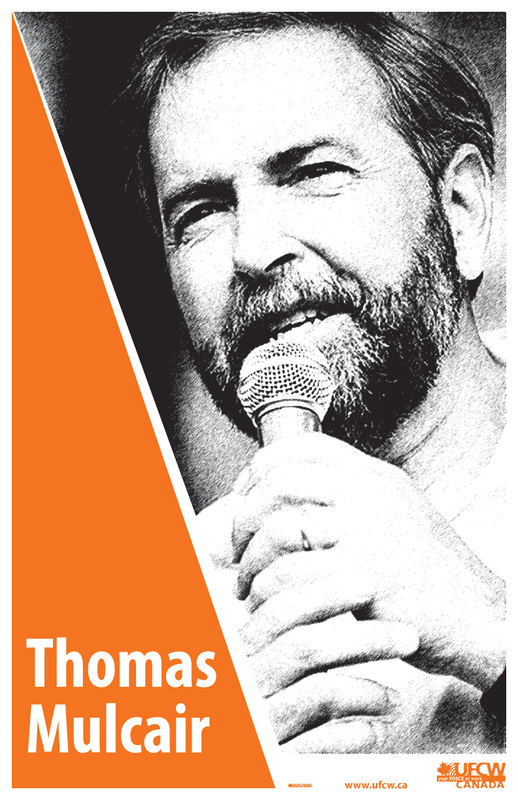 UFCW Canada members are also encouraged to download and distribute the union's official poster for the Thomas Mulcair NDP Leadership campaign, which can be accessed at www.ufcw.ca/posters. 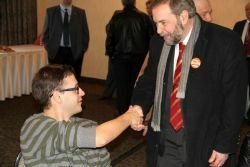 To find out more about Mulcair's campaign, visit www.thomasmulcair.ca.